Let's face it. "How much time do I have left until I die" is a thought that crosses the minds of many folks, whether due to prostate cancer, other illnesses, or even when we're enjoying good health. 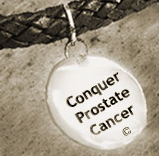 In the case of prostate cancer this matter is that much more poignant because of the frequent response that more men die With conquer prostate cancer than FROM it." Where are all the studies that prove the 1-2-3-4-5-year and 10-year survival rates for patients who opt to use cancer surgery & different therapies (hormone/chemo/radiation)? Doctors throw out generalities, i.e., "We've had good results with..." I want to see facts. Thanks. - Ron K.
Thanks for your request to marshal reports that demonstrate survival rates for prostate cancer survivors. Generally no one treatment option has been demonstrated to add greater longevity than the next. However the American Cancer Society stipulates that for all prostate cancer treatments after 5 years most survivors (99%+) are still alive, after 10 years the figure is closer to 93%, and after 15 years it's 76%. Putting it differently over 90% percent of prostate cancer survivors will still be alive 10 years after their first diagnosis and treatment, and over 75% will still be alive after 15 years. With current medical advances and earlier detection compared to 15 years ago, it's likely that those who have been recently diagnosed have better prospects for greater longevity compared to this study's results. After all the study refers to men who were first diagnosed 15 years ago!. In addition it's recently been discovered that, exercise after prostate cancer treatment of various sorts can lower your mortality risk from this disease by 25 percent. This too has been written up in a recent ACS report, although as of this date (May 15, 2010) it's not been peer reviewed or published.